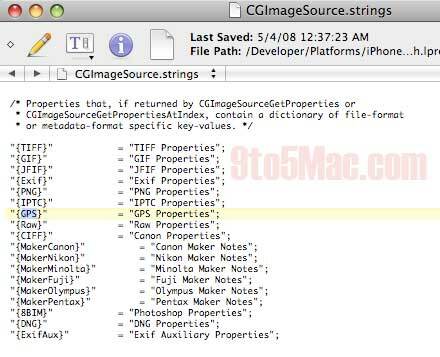 While by no means conclusive evidence of GPS capabilities in the iPhone camera software, the latest builds of the SDK are littered with GPS references. Whether these are just templates (you can see other camera manufactures included as well) or needed by the 3G iPhone camera software is unknown. 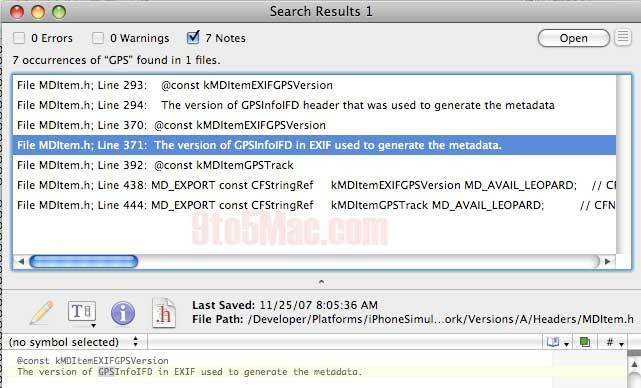 GPS camera software is used to put location (landmark) metadata into the photo files. Applications like Flickr, and Google earth use this data to arrange photographs (and videos) spatially based on this information. For instance, if you snapped a picture in Paris, you could later organize you pictures – perhaps in iPhoto? – by Country/city. Cool!